T Racking always fright to offer customer a most competitive cost to help customer increase profit! We know when customer make a decision, price is one of the most important reason for customer to choose supplier. The basic business principle of T Racking is offer most competitive price base on quality product. T Racking keep thousand ton of common material in house, we purchase large quantity of steel in once time thus get a discount price from material supplier. The material quality is also kept in a good level. 2. Use advanced equipment to save tooling cost. From 2009, the labour cost in China is also keeping increasing. To save cost and increase tooling efficiency, T Racking use lots more advanced equipment in workshop. 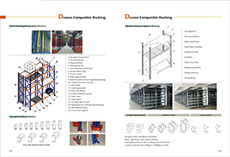 Build more than 5000 projects all over the world, The engineer of T Racking is skilled to help customer reduce logistic & storage cost by design proper warehouse according to the operation situation.